There is a new app which lists all the public sculptures in the City of Westminster including my work ‘Aspirations’ in Curzon Street. sculptors who created the works. 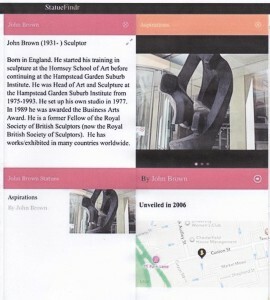 Here is an example of one of my pages – there are also images of the entire sculpture. or…. just type StatueFindr in Google and various Twitter/Facebook/links to Apple/Android StatueFindr pages will all come up.